As the Ministry of New Media continue to gain traction with both New York and London Digital Signage Week, we note that The DailyDOOH Media Summit in 2018 has a new name. 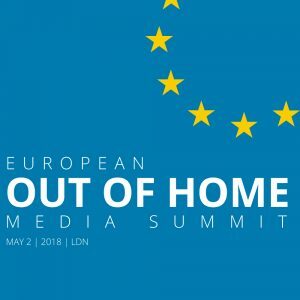 The European Out of Home Media Summit will take place Wednesday May 2, 2018 at BAFTA. Although the event has pretty much been ‘European’ in nature since inception, there is a definite re-emphasis on continental Europe for the year before (actual) #BREXIT and this can only be a good thing! London Digital Signage Week will take place April 30 – May 4, 2018 and as with its counterpart in New York, the week is for anyone in digital signage; interested in retail, employee communications, smart cities, digital out of home and of course digital signage! This entry was posted on Friday, January 12th, 2018 at 09:01 @417 and is filed under Scuttlebut. You can follow any responses to this entry through the RSS 2.0 feed. You can leave a response, or trackback from your own site.